Awoke at 7:30 feeling good. Slept very well last night. Had a good scrambled egg breakfast. Did the laundry and straightened the kitchen. Frank went to his carving class. After lunch we go to the movies to see The Bodyguard. I still feel good. We have a steak, salad and baked potato for dinner. I eat only a small potato and some steak. I save my salad. Later I eat an eclair. I feel fine until I eat the second eclair at 9. At 11 I still feel very full and uncomfortable. 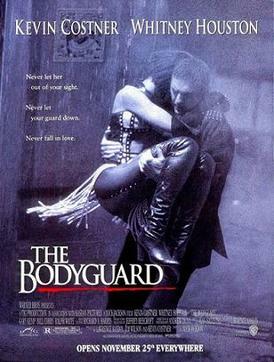 Whitney Houston was a famous pop star who appeared with Kevin Costner in the movie "The Bodyguard". She was born in 1963 and was "discovered" at the age of 19, going on to pursue a fabulous singing career until her death in 2012 by accidental drowning in a Los Angeles hotel room. Cocaine was found in her system. It seems like Mom and Frank go out to the movies quite often. Glad she had a good day this day.